Nic Cage hunts serial killer John Cusack in the true story of Robert Hansen who killed at least 24 women in Alaska in the 1970’s and 80’s. Unexpected low key performances highlight this police procedural show just how good Cage and Cusack can be. 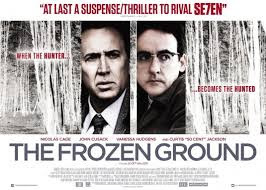 This is a nifty little thriller about how a very bad man was brought down by a series of mistakes that were only discovered because Cage (playing a character who is an amalgam of several officers) wouldn’t let it go. Help Preacher 6 cross the finish line.